What a dig it’s been! The last feature has been dug, the archaeologists have sorted out the mountain of paperwork and the equipment is beginning to be taken away so that backfilling can start next week. The last week is always a bit manic, which is why you haven’t seen a blog post from me in a while! Rosie gives the site a final soaking for the photographs. The north-eastern corner of the hall is in the foreground. Rosie investigates a tricky area to reveal several post holes. The digging really picked up in the last week. 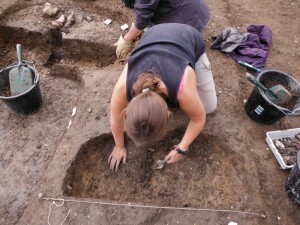 Even Rosie was to be seen digging, as supervising of the volunteers and students had to be be squeezed in between excavating the last features on site. Finally, excavation on the southern entrance doorposts of the hall building got underway. If you compare the picture of the northern doorway I put up in a previous post, you can see they are much further apart – a wider doorway facing towards the stream down slope. 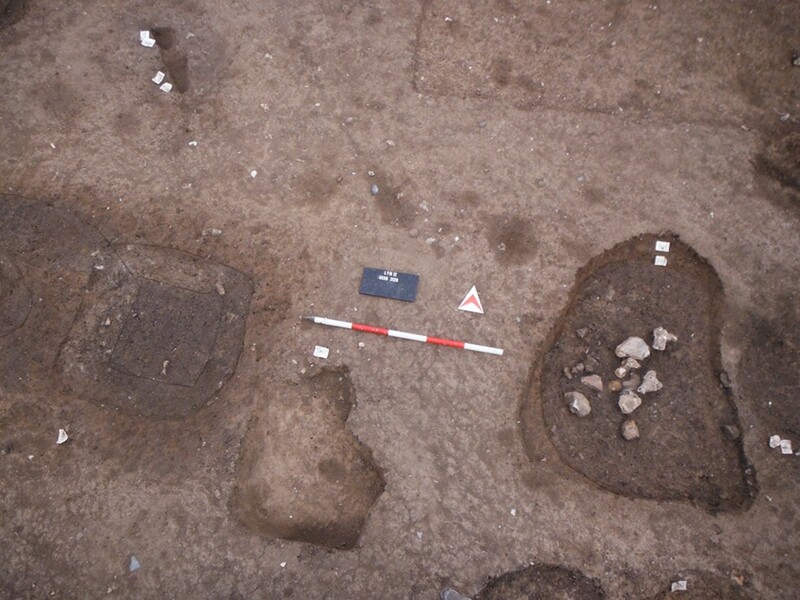 It may be significant that the larger doorway faces directly towards the settlement area that we excavated in 2010, where we excavated contemporary sunken-featured buildings. The southern doorway post pits from above. The red and white ranging pole indicates the gap between the door post pit on the right with flints, and the square looking door post pit on the left, without flint packing. 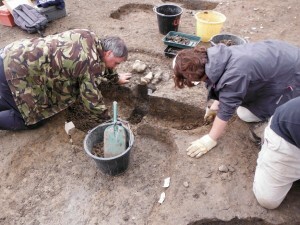 Keith and Bev exavate the south-western door post pit. You can see the large rectangular plank hole in the middle, under excavation. The important thing in the last week was to get the hall building and the sunken-featured building fully excavated before the end of the dig. 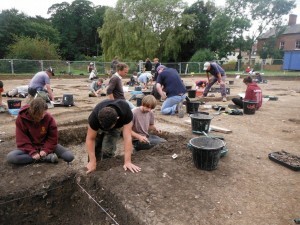 The corner of the site that had the SFB and north walls of the hall needed all hands on deck. The north-western corner of the trench got very busy in the last week! We knew we’d manage it, it just required a bit of an extra push, and it got rather crowded down at this end of the trench! 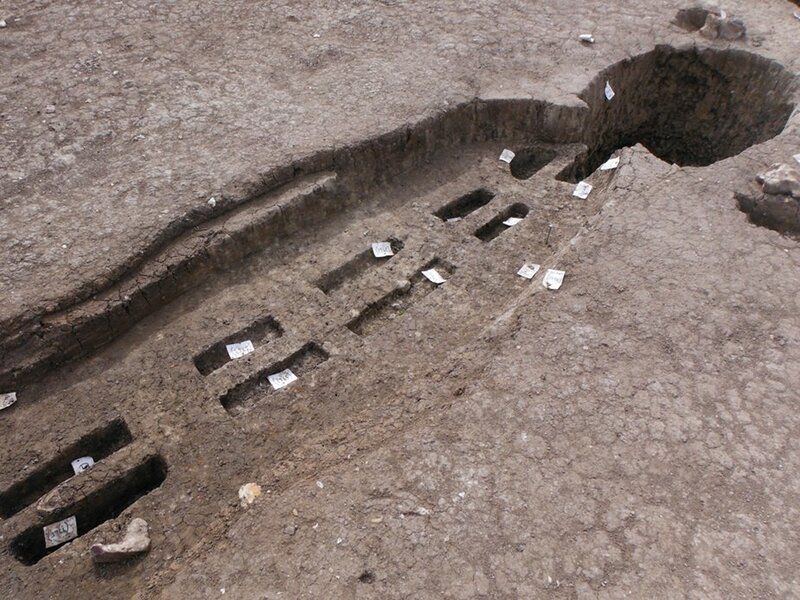 The plank holes were excavated carefully and you can see the double rows of planks that would have had wattle and daub in-between them. The digging of the SFB went right up to the last day and into the unofficial ‘week 7’ of the dig. Usually these extra days involve last minute drawings of the site and sorting out of the recording documents, but I was discovering and recording post holes in the SFB right up until 4pm on Tuesday! 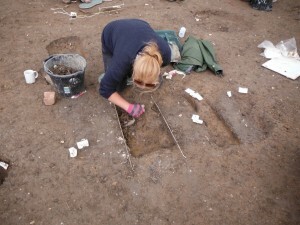 The wall trench planks are excavated carefully and it is easy to see the double plank construction of the hall. A huge thank you goes to everyone that helped dig these final features in the last few days, and particular thanks to those final few who came back on Monday and Tuesday to help us wrap up a few last things – it is because of you we are able to say every single feature was excavated and recorded. The harness mount as it came out of the ground. Although most of the conservation and analysis takes place at the post-excavation stage, we were able to send off some of our artefacts for conservation straight away, which meant that we got feed back on some of our metal finds while we were still in the field. 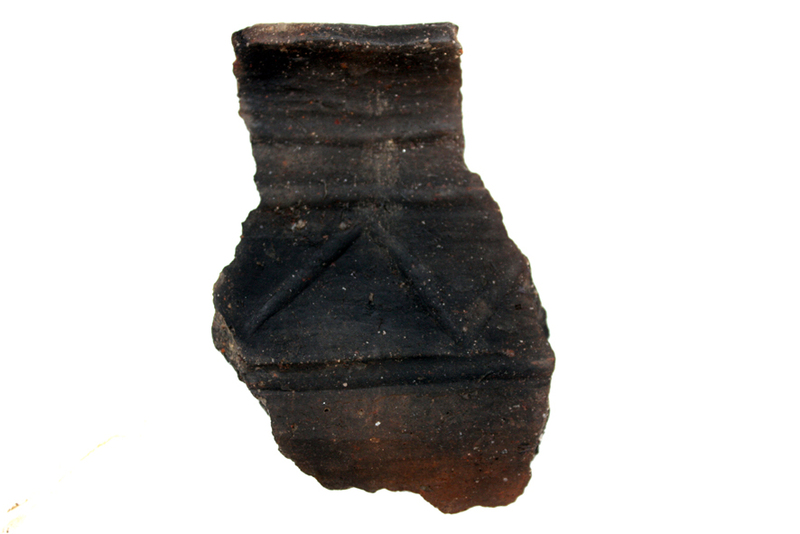 Here you can see we have had the harness mount that we found in one of the wall-trenches x-rayed, and it appears to have rather nice scrolled decoration on the edges. Any other decoration will be revealed in cleaning and conservation, but it is wonderful to already have this much information. 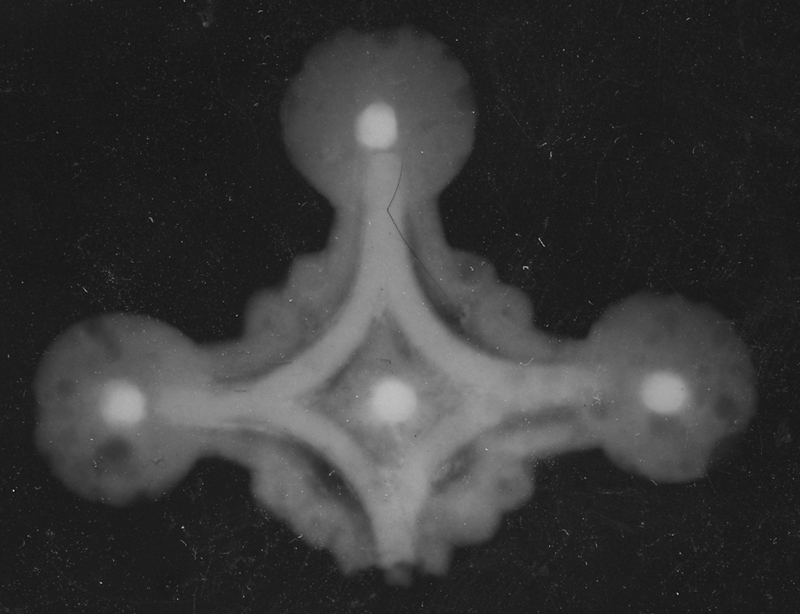 The horse harness mount was x-rayed while we were still digging on site, and revealed a wonderful amount of detail. This year it’s been generally quite dry for the six weeks we were in Lyminge, but on Wednesday and Thursday we were treated to some rather epic weather! The weather turned on us and this epic bank of cloud rolled in. Celia looks a tad worried! Luckily, considering everything that needed to be done, we only lost an afternoon to heavy rain. If it gets too wet, too many boots churn up the clay and the archaeology is wrecked. 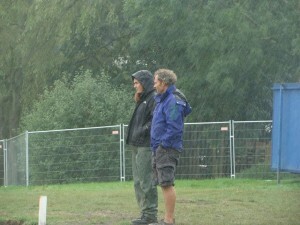 There were a couple of extremely wet archaeologists rescuing paperwork when the heavens opened! The rain was dramatic, but there were exciting finds, too. The SFB continued to be productive up until the very last day. Ane, Jess and myself are holding the finds that we all got literally within seconds of each other. Digging in the SFB almost guaranteed a find – here Ane, Jess and I found some bone comb, decorated pottery and a small red glass bead within moments of each other. Ane (left) is holding some fragments of decorated bone comb that she found, I have a very large pottery rim sherd, and Jess (right) has a tiny red glass bead. 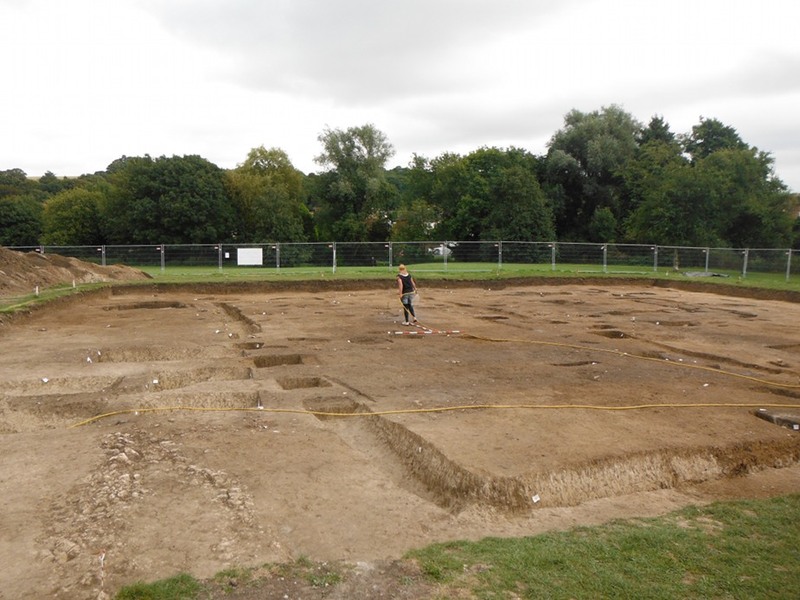 On Tuesday we took stock of the excavated SFB, and Gabor and I realised that it had two sets of central posts, so that the pit had been re-cut and enlarged at some stage, but not backfilled in between re-cuts. In a way, we have two SFBs rather than one! 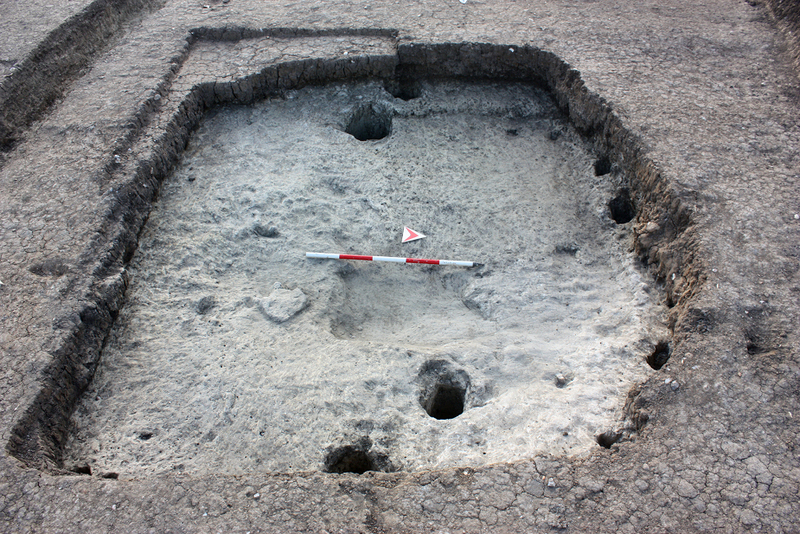 The sunken-featured building is fully excavated and it is now clear that the pit was enlarged and the central support posts moved during the SFB’s lifetime. 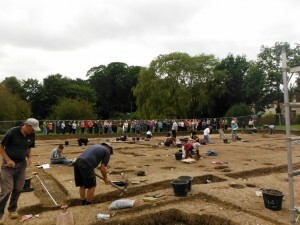 Last Friday we had a wonderful treat, now an annual event on the dig. 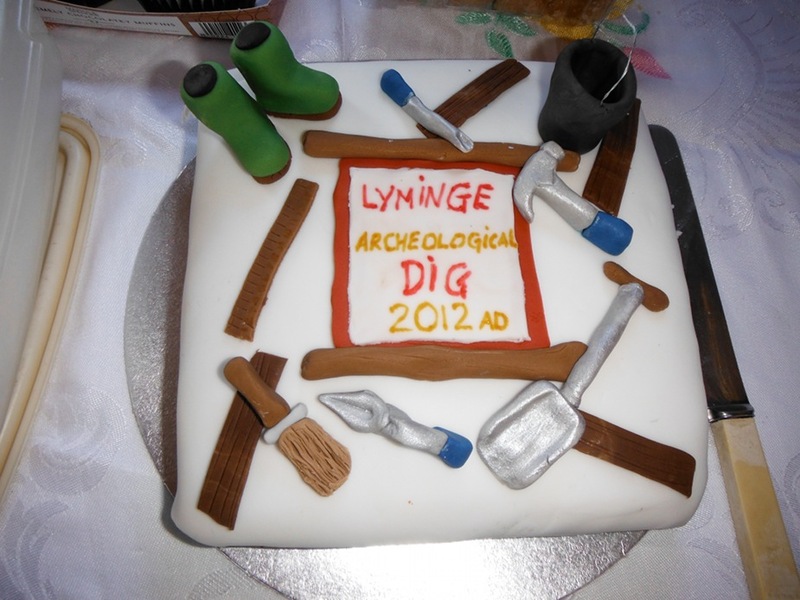 If you’ve spent any time digging with us you’ll have noticed there is a lot of cake on site! Many of the finds washers and some of the diggers have been bringing cakes to share at tea time, which are always well received. 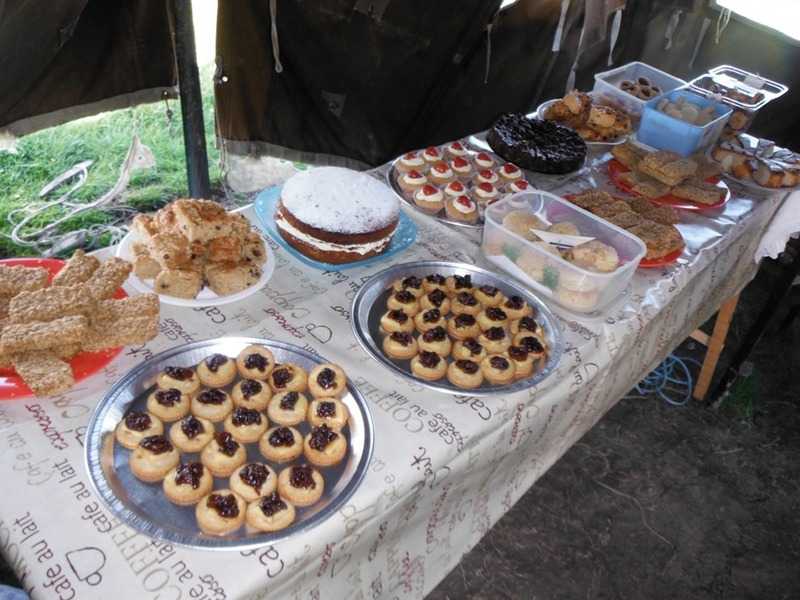 As a final treat, on the last Friday of the dig a tea party spread appears in the mess tent, an absolute feast as you can see. There was even an archaeology themed cake! Gabor set to, cutting it with the biggest comedy trowel he could find, and it was absolutely delicious. 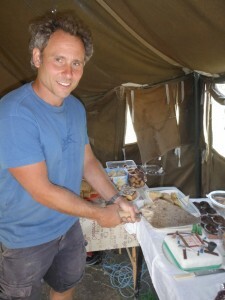 Gabor cuts the cake with the largest trowel he can lay his hands on. We took this as an opportunity to thank everyone who had taken part and hand out a few tokens of our appreciation to those who had provided particular help on the project this year. Local volunteer Stuart Hunnisett is thanked for his participation and endless help with a token of our appreciation – a photograph of the site under excavation. 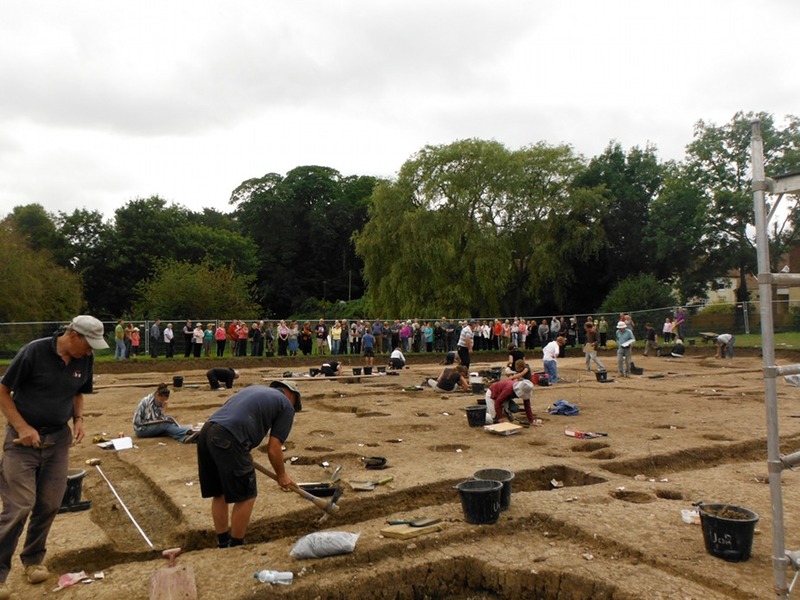 I want to say again how well the excavation went as a direct result of the level of support within Lyminge, both from volunteers and those who attended the site tours and expressed continued interest in the excavation. The final site tour was very well attended, we were so pleased people kept coming right until the end! The last site tour of the season was extremely well attended. Something that most people won’t know about is our night-time escapade. It is a tradition amongst the dig staff that at the end of every season after the volunteers and students have gone home we put tea lights in the post holes of our significant buildings at night and sit on the spoil heap so that we can see the floor plans of the buildings lit up. It was particularly wonderful this year because of the sheer size of the hall. 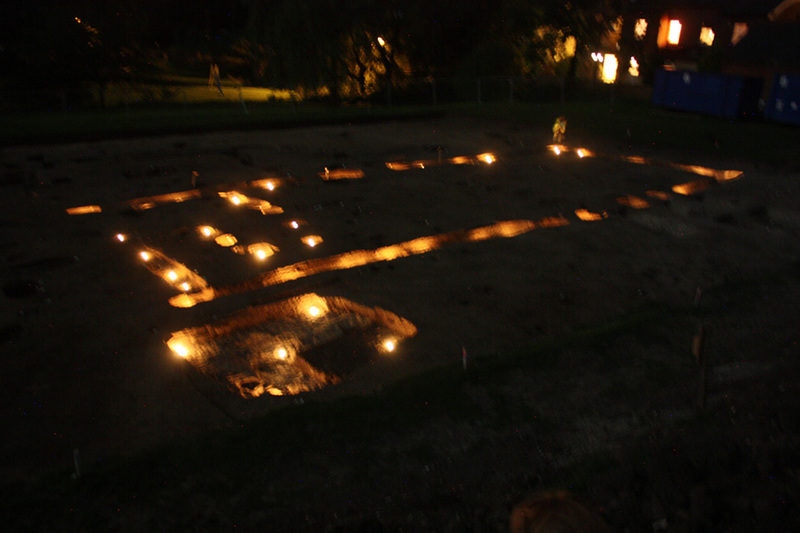 We put tea lights into the wall trenches of the hall and the pit of the sunken featured building, to create a beautiful impression of the floor plans. You can see the partition walls in the hall really clearly. It is very difficult to capture in a photograph at night time without good night-time photography equipment, but the effect was stunning, and all of us talkative archaeologists were silent for at least ten minutes, thinking about the people 1400 years ago who had been in the hall itself at night and the wonderful new people we’d met this year who had a hand in excavating it during the day. What an amazing way to end a fantastic season of archaeology. 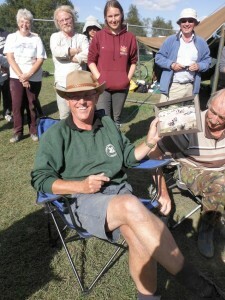 Finally, Bill came back with his helicopter drone on Sunday to take photos of the site fully excavated. 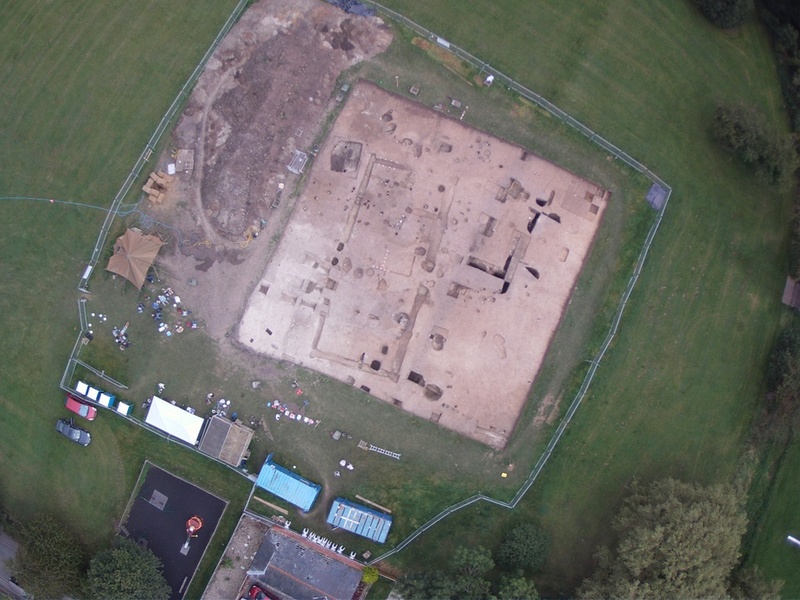 This is the amazing result, and I’m sure you’ll agree that the site both looks fantastic and is of huge significance for Anglo-Saxon archaeology in Kent. Bill’s helicopter drone takes a photo of the site fully excavated – you can see the whole of our dig site in Tayne Field here – and plenty of people having a lunch break! The hall has come up beautifully and the floor plan is as clear as we could have wished for. 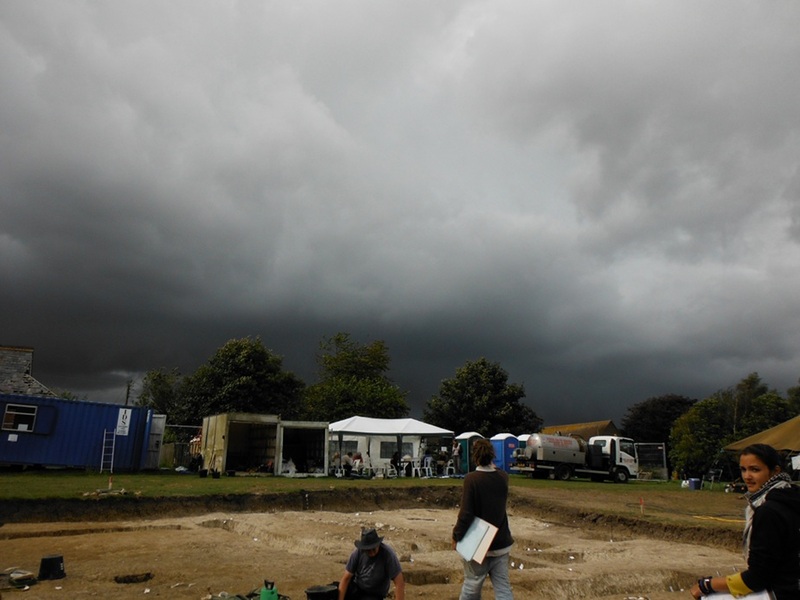 We’re excited about what we will find it future seasons, and I will continue blogging (although less frequently) throughout the year with any new discoveries at the post-excavation stage. 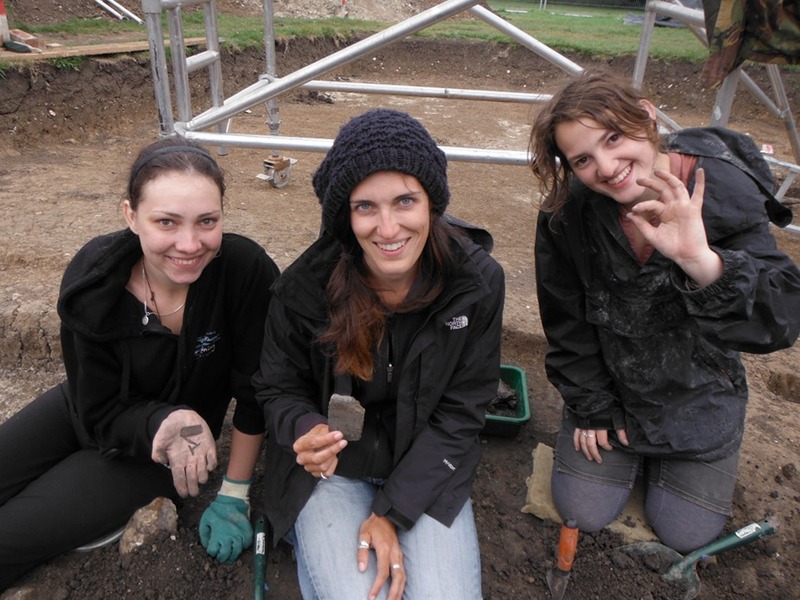 It is a real boost to the staff to know everyone is just as interested as they are, so thank you all for following the blog, responding with such enthusiasm, for coming to the site tours and a huge thank you to all the students and volunteers for helping us get this site excavated! Huge congratulations to everyone involved in the dig! 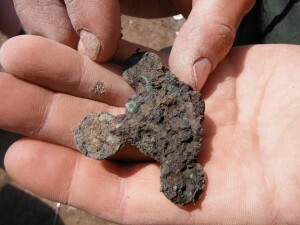 It’s been fascinating to follow the blog and I look forward to more during the year, especially about the finds. I am missing you guys already.I can’t stop thinking of the site.Thanks Alex,Rosie,Gabor, Celia and others for wonderful excavation and party dig this year. 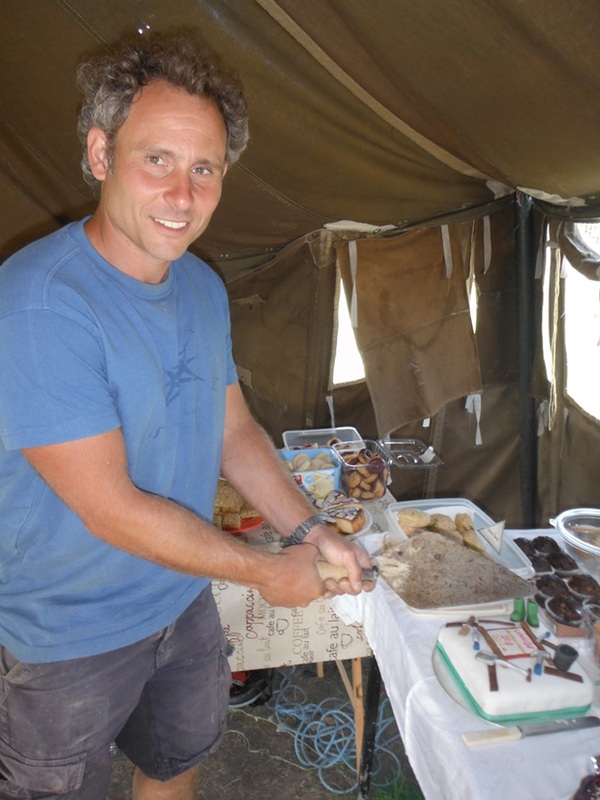 Hi Alex, Thank you for a lovely dig, I am so pleased you managed to finish digging the SBF, without my help, shame I was not there for those last new finds, great. The Great Hall looks amazing in candle light and was a great way to see what it must have looked like. Looking forward to next year can’t wait.